These are all games that we need to win if we are going to finish in the Top 3 or 4... It would feel awfully good to come out of this stretch with a 7-2 conference record! Getting KB back during this stretch will help immensely... and hopefully getting him back at full speed/fitness by that home SMC game. Having another dangerous scorer to have to defend will help open things up at all positions. Finishing 3rd instead of 4th places us on the opposite side of the bracket from GU. 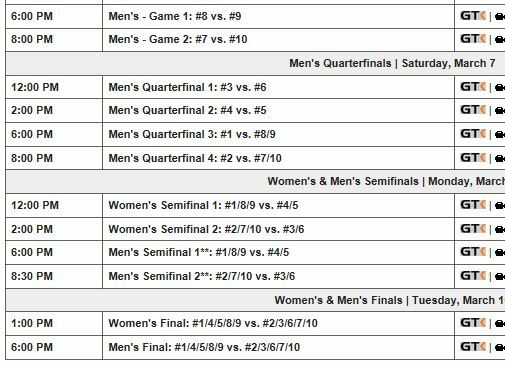 I would much prefer to face BYU than GU in the semis... and it all really picks up in the next 3 weeks! GO PILOTS! 100% agree. These next two few weeks are going to determine whether we're real contenders for a high finish or not. Gotta take care of business against these teams. USF has been a real thorn in our sides the past few seasons - would be great to get that one. At Pepperdine will be tough, as will - of course - SMC. As we've been talking about over in the other thread, these games are all against other middle-of-the-pack teams, or the two teams that we really cannot afford to lose to (Pacific, LMU). We absolutely MUST beat the two bottom feeders, even on the road. And we need to beat the other Mid-6 teams at home (though a loss at home to SMC would not be as damaging as the others). Going 6-0 in this stretch would be an impressive feat indeed, and would put us on a good path for 3rd or 4th place. Going 4-2 (with losses at Pepp and to SMC) would still be good, and should keep us right in the hunt for 4th. Losing at home to SCU, USF or Pacific would be a major setback. Stonehouse wrote: These next two few weeks are going to determine whether we're real contenders for a high finish or not. Gotta take care of business against these teams. We seem to have our answer: No, we are not real contenders. Through the first 4 of these 6 games, we are 1-3. Amazing to see how the outlook for the season has changed over the last two weeks. NoPoNeighbor wrote: Amazing to see how the outlook for the season has changed over the last two weeks. Yeah. Believe it or not, this team really did have a decent NIT shot two weeks ago...I trust those numbers that I crunched and now think it would have taken about an 11-7 WCC record to get there and a QF win in Vegas, but there was every reason to believe those were achievable goals heading into the Santa Clara game off decent efforts against BYU and Gonzaga. You said it, it's amazing how much the USF and LMU losses have changed the course of the year. I'll be watching tonight...here's hoping they get it back on track against Pacific and get some confidence going for a Saint Mary's team that will be coming off an emotional game in Spokane. During those two weeks Oregon State has begun to show up on the NIT radar according to a few accounts I've read. OSU's RPI is now 84....just one notch ahead of Valpo! UP has dropped to 162.....6th in the WCC ahead of USD (187); USF (194); UOP (209); and LMU (233), and just behind SCU (155). All WCC home teams won. OSU beat UCLA tonight at home, and is now 13-5. USF over Pepp?! What the?!! We finished 2-4 in these "next 6 games," which clearly establishes that we are not contenders for a top-4 finish in conference. In what should be a peak season for the program, do the results of these 6 games effectively seal the fate of the Reveno administration? NoPoNeighbor wrote: do the results of these 6 games effectively seal the fate of the Reveno administration? I think this is a big question from here on out. The questions I ask is "Has the program grown under Rev?" I don't know that we really have--any lift IMO has been from the lift in the conference. We had moments, but that was proven to not be sustainable. We had a 2-3 good seasons, but WAY too many bottom of the conference finishes. The WCC continues to grow as a conference (thank you GU, SMC, BYU), but we have not been able to improve our position relative to the rest of the conference. From the "butts in seats" perspective, there has been no improvement there. We continue to have zero relevance in the local or regional sports scene. I don't know how much this is a factor, but Rev was hired by the previous Athletic Director... the U also has a new President now. PN makes good points here. Although one might also look at it from the perspective that the program has been able to keep up with a constantly improving conference. The WCC was in no way a slouch before, but now we're one of the truly elite non-Power 5 conferences. We've all run ourselves ragged on the attendance issue. In terms of local and regional relevance, I'll just say that it is tough to gauge based on metrics of traditional media when such outlets are themselves much less relevant. Halfway through the conference season is a decent enough time to take a look at the state of the program, and where we are or could be headed. So much goes into it, like administration expectations, financials, buyouts, performance, and availability and cost of a better replacement, that it would be difficult to fully vet with our lack of detailed knowledge. Luckily this is an internet forum! This really is one of the more important discussion we can have as supporters of the program and school. I am not really sure what to call the collective group of posters. Anyway, I felt like I needed to rant real quick about some things I have noticed over the past 4 games. To start, I recently moved to Portland (August) from the Mid-South (Memphis area). I live relatively close to the University so have decided to make this my team to support (mixed emotions about this decision). I have come to notice that time and time again people on here talk about the atmosphere in the building or lack thereof. 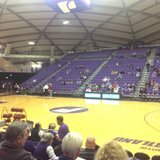 Last night and Gonzaga seem to be the exception to the rule of the Chiles Center being boring. We all know that students in college athletics makes a huge difference, but the general fan also makes a huge difference and I was disappointed to see that so many fans sat on their hands and stayed quiet last night when the students finally showed up. Did you join in when the students chanted "Defense", probably not. Coming from Memphis, I can tell you that students don't show up to games all that often, especially during break. I mean, the Fedex Forum is a good 15 minute drive from campus. So it was usually on the general fan to support the team and make some chants or add to the atmosphere. I guess what I am really trying to get at, is that for the last 4 games, regardless of if "students" show up or not. We the fans can make a difference in the feel of the game, granted the music choices stay at the same level as Saturday's game (Thursday's game was just a terrible game and boring from every standpoint imaginable). We can yell during free throws, chant with the dance team (I sometimes feel bad for them), and make the game fun for what it is. End Rant - I really enjoy everything you write on here. Very insightful on upcoming games and the views of the program. I agree completely, PilotSpectator. "Spectator" is indeed how most UP "fans" (short for fanatics!) behave at the Chiles Center. Sitting quietly as if they were at home on the couch, watching the game on TV. This is live, in-person D-I basketball! Let's go! While I am not happy with what Reveno has been able to accomplish with the program in 9 years, there would be some real drawbacks to sacking him. One big concern: What happens to the great recruits we have coming in, and our talented underclassmen? LMU is an instructive case. Max Good had one of the top recruiting classes in the conference coming in for this season, and a STRONG group of young guys already on the roster. Many of the guys on the team then transferred, and the recruits de-committed, when Good was fired. In regards to the question of attendance and the program's relevance in the city and region... I don't think it is fair to make those things part of the evaluation of a coach's performance. UP's failures there should be placed on the shoulders of others in the athletic department. Of course, increased attendance and attention to the program would make the coach's job a heck of a lot easier, in terms of recruiting and winning games at home. Good points, NPN. I think many programs are too quick to fire a coach and go looking for the next best person. I think the Athletic Dept needs to have a high confidence level that if they make a change, it is in fact an upgrade (and not taking a wild chance on an unproven candidate). LMU over the past 5 or 6 seasons has been an example of how NOT to handle coaching changes. Remember the Bayno fiasco? Then again, LMU had a very bare cupboard coming into this season, yet they beat us and USF, and have been competitive (Many 1st-year coaches, including Rev, are not their first season). I will disagree a bit on the attendance issue... The head coach is responsible for the basketball program, and for developing an entertaining brand of basketball that people will pay to come see. While there are many other factors and restraints within the Athletic Dept., IMO, that is primarily the Coach's job. Clearly the A.D. is very involved, but the untimate responsibility for results lies on the head coach's shoulders. Rev has not developed a brand of basketball that is exciting, contagious or drawing attention, in spite of the Athletic Department paying for foreign trips, all the recruiting budget he asks for (trips to Europe and Australia?! ), expanded/renovated facilities, increased pay for Assistants, etc. We're far and away the smallest school by undergrad enrollment (which, don't forget, also means we're far and away the smallest school in terms of alumni), yet we're 5th overall in average attendance. And I bet if they did a breakdown of student attendance, we'd be right there at #5 or even higher - they may not make a lot of noise (which is frustrating), but our students actually do show up in pretty good numbers. Do I wish we were doing better? Of course. Could pretty much all the WCC schools that aren't Gonzaga or BYU be doing better? Absolutely. Keep in mind that low student attendance for college sports is not an isolated issue, and it's certainly not unique to UP. And of course these problems are magnified for mid-majors, which don't have superstars or nationally ranked teams and can rarely get marquee opponents to play in their gyms. We were lucky to have Oregon State at Chiles this year, but it'll probably never happen again in the near future. When's the last time Oregon, Washington, Washington State, or any other Pac-12 team (heck, even Mountain West team!) has played in Chiles? Those games are few and far between. And think about this - every single one of our home games are either broadcast online or shown on TV. It's pretty easy for a fan who might otherwise go to 4-5 games a year go to only 2-3 instead and watch online instead - don't have to deal with I5 traffic, parking, etc. Again, I'm not saying we couldn't be doing better. I'm just saying that it's not like UP is an outlier in struggling with this, and a lot of the challenges are out of our control. Fact of the matter is that it's tough out there for everyone - even blue bloods like Duke and Kentucky. Good info, Stonehouse. Its good to remind ourselves (myself?!) that attendance at sporting events is down across the country. I also don't want that to be a crutch/excuse to think we can't do better. If you take away the GU and OSU games, what was our average attendance? (I would argue that most of the increase over the average of all other games for these 2 games was largely Beav and Zag fans). Our true average must be closer to 1,400, which would be at the bottom end of the spectrum. Attendance was trending upward in the 2-3 years that we did well... if we were able to sustain a few years of doing well, I think the fans would come in larger numbers; the problem is, we keep falling back down to the bottom of the conference standings. If we were to win with any regularity, more people would show up. Side note: The attendance at the Pacific game was exceptionally low--does anyone know why that game in particular seemed low? It's not good math to subtract the Gonzaga's or OSU's gates unless you do the same for the top attendances with the other schools. I agree that attendance follows success. Maybe the Week before in CA put some people off from the effort. But that might not even be it. I hear BYU hasn't done that well during the week either. And there is only 200-250 difference in any of the Thursday games this year. And having Saturday midday games doesn't help attendance totals , either. And maybe we don't yet have any real rivalry with Pacific. I agree that you have to compare apples to apples... I would be curious as to the source of Stoney's data (when is that average as of? Is that announced attendance? Tickets distributed?) You can really only compare figures at the end of the season when the full schedule has been played--in the numbers above, USF and SCU will likely move up after GU plays there next week. Hang out at a pub before a game? Hmmm, that is a brilliant idea that I may just have to try! Overheard that with the largest freshman class this year, more and more classes are being slotted for nights as the school just doesn't have the classroom space. Could this be the a small reason for low turnout on Thursdays? That's part of it. A couple profs who sit around me either can't come or are late to Thurs. games. I saw a lot of students in the library last Thursday. Gol darn bunch of over achievers.